200 hour Yoga Teacher Training Course is suitable for any individual who is interested in undergoing Yoga Teacher Training Course inspire of being at intermediate, beginner of advanced level. This yoga course is completed in 200 hours where there will be detailed lessons regarding asanas, pranayama which is the breathing practice, alignment method, bandha, kriya, mudra. All these aspects of yoga will be practiced both in theoretical and practical way. The 200 hour yoga teacher training course will cover the subjects like yogic physiology and anatomy. The students will be provided with the Ashram lifestyle in order to teach the students to live a stress free and happy life. The 200 yoga teacher training course will also include the intensive knowledge including methodology of yoga teaching. Students will be p provided with the knowledge of the Hatha Yoga which is the basic from of yoga. They will be facilitated with in-depth knowledge and the modifications of the basic asanas. The students will be provided with the techniques of correct and yogic breathing which will be covered in the Pranayam classes. The 200 hour yoga teacher training course also encompasses the knowledge of the kriyas, and Ashtnaga Vinaysa Yoga which is the advanced from of yoga. After the completion of the Hath Yoga series, the students will get the chance to enhance their yogic knowledge with advanced yoga that will assist them in teaching the advanced techniques to their future students. They shall also be provided with meditation and relaxation classes during the course. The objective of the 200 Hour Yoga Teacher Training Courses in Dharamsala is to facilitate the beginners as well as the experienced students in Yoga with very theoretical and strong technical experience. This will facilitate them for performing Hatha Yoga and Ashtanga Vinyasa Yoga and the advanced series of the different styles of yoga with the right alignment and perfection effectively. The course of 200 Hour Residential Yoga Teacher Training in Dharamsala will provide the students who will become future teachers to be autonomous in a complete manner and prepare them to have their classes in their studios. In the 200 hour teacher training program in Dharamsala, students get to learn the outstanding combination of Hatha yoga, Iyengar alignment, and Ashtanga Vinyasa Yoga. This combination of all the three styles of yoga has an eventual goal of performing yoga in the most effective way to the best standard. Yoga ttc in Dharamsala will be one of the most beautiful experiences in life for you. In the 200 hour yoga teacher training course in Dharamsala, you will enjoy being in the serene and majestic valley in the midst of the mountain ranges. You will have the yoga practice and the stay in one of the most peaceful and calm places on earth. The yoga center is situated in a location which is very far from the hustle and bustle of the urban life as the training of yoga will be imparted in the serene background of the beautiful nature. There area in which the yoga school is located is free from the construction sites and the surrounding of the resort is completely peaceful. The yoga course is oriented towards providing the students with the knowledge of the proper alignment, awareness regarding the anatomy of the human body and in-depth education regarding the subject. By getting enrolled in the 200 hour yoga teacher training Dharamsala, students will get ample of knowledge for becoming an efficient yoga teacher. The knowledge that shall be imparted in these 200 hour teacher training course will provide the knowledge as well as awareness of various elements of yogic lifestyle. The 200 hour yoga teacher training program makes the vision of the students to have expanded vision of yoga beyond the practice of physical asanas and have greater awareness regarding the spiritual and mental side of yoga. Students will be made to push their limits in all aspects of life which will provide them with the scope to have a growth as a yogi along with being a better human being. Right from the history of yoga to the physiology and anatomy of the human body, the topics encompass the aspects that were unknown. The course is not limited to the eight hours yoga practice for the students in a day. This course is oriented to make the students better teacher of yoga along with cultivate a spiritual practice as well as solid physical practice. In this course, different aspects are covered regarding the aspects like chakras, pranayama, and meditation. Students will gain the experience of practicing yoga to be the complete yogi for the complete duration of one month. It will be ensured that the students maintain the optimum balance in their lives. The program is also designed with the inclusion of free time and excursions for the students which will facilitate the participants in exploring the nearby areas. The schedule of the daily yoga classes in Dharamsala will be completely oriented towards the yogic way of life and health. Students will have the experience of the best 200 hour yoga ttc in Dharamsala throughout the course. Every day in morning for the students will begin with the Kriyas and Pranayam for the cleansing and purification of the body, spirit and mind. Such a beginning provides a very good foundation for the Hatha and Ashtanga Vinyasa yoga sessions. Right from the beginning of the training course, Hatha and Ashtanga Vinyasa yoga class, the students will be trained by the senior teachers, and during the last period of the entire course, the students will be allowed to have their practice. The practice in the morning will end with a fulfilling meditation session that will be followed by a wholesome breakfast. There will be conduction of subject classes in the midday, and the subject will be changing every week. The training will include all the subjects from philosophy of yoga to physiology and anatomy. Participants can also request for marketing classes. These classes will assist the students in getting knowledge regarding self promotion as yoga teachers and the way in which they can conduct marketing of their own centers of yoga. In the afternoon, there is a class on the teaching methodology. Students gain knowledge regarding the correct postures in an elaborate manner which enhances their practice and also provides them knowledge about the correct alignment. In the evening, there are classes on the yin yoga, Vinyasa flow, Restorative yoga and Hatha yoga. The conclusion to the day is made with the evening meditation. 22:00 pmEarly bedtime after successful day of 200 hours YTT course. 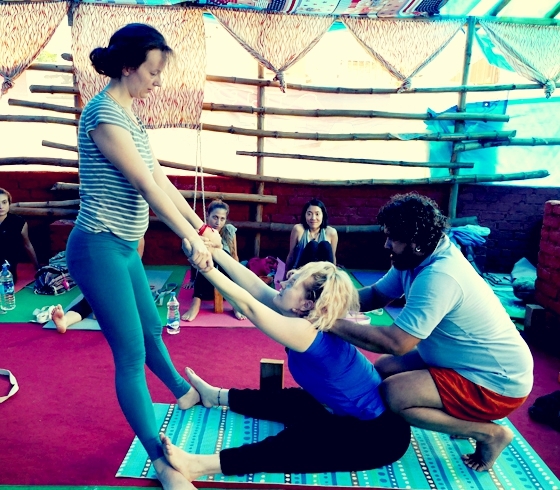 In the 200 hour yoga teacher training course, the subjects that will be covered are sequencing, yoga lifestyle or philosophy, asanas along with the modifications and alignment, sutras of yoga, Ayurveda and yogic eating, pranayama, physiology, anatomy, chakras, various types of yoga including Vinyasa and Hatha. The training will be provided in theory as well as the practical methodology of all the Kriyas, Mantras, Pranayam and different techniques of Meditation and asanas. There will be the inclusion of the sitting poses, inversions, standing poses, arm balances, backward extensions and different other postures. Students will also be learning the Sanskrit language to master the Asanas names. There will be the inclusion of Kirtans, Mantra Chanting, Satsang, Kirtans which is included in the Bhakti Yoga.